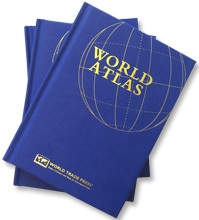 As with other World Trade Press world atlases, the World Travel Atlas is printed in full color on coated paper, with sewn signatures and hardcover binding. The World Travel Atlas is available in quantity with a custom cover, or foil stamped cover and is perfect as a promotional give-away business. Contact a World Trade Press sales representative at (707) 778-1124 x3 for bulk pricing.